Honda Aviator is the third scooter that Japanese maker offers in India after the Activa and the Dio. The Aviator with its tallish look and ‘Live your style’ slogan targets is mainly targeted towards male riders. Honda Aviator is the third scooter that Japanese maker offers in India after the Activa and the Dio. The Aviator with its tallish look and ‘Live your style’ slogan targets is mainly targeted towards male riders. Sitting at the top of current Honda scooters line-up in India, the Aviators gets the same engine that powers the Dio and the Activa. The 109cc single cylinder air-cooled engine churns out 8bhp at 7000rpm and maximum torque at 8.77Nm at 5500rpm. The scooter gets the V-Matic transmission and can be started using kick start as well as self-start option. 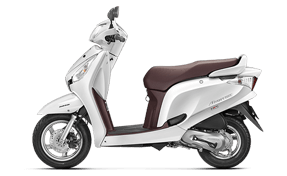 With the recently updated Honda Eco Technology (HET) the scooter has company claimed efficiency of 60kmpl. The Aviator is sold in two variants in India, STD, and DLX. The only difference between the two is that the STD version gets drum brakes, whereas for the DLX variant gets a front disc with Combined Braking System (CBS). Honda Aviator comes up with a well-designed body and an attractive front look which has curvy headlamps and clear lens indicators. The cushion seats offer a comfortable seating along with the spacious legroom to ensure a pleasant ride. Body dimensions of the Honda Aviator are 1,802 mm x 697 mm, 1,162 mm (LxWxH) featured with a robust tail lamp with clear lens blinkers and an underseat storage capacity of 20 liters. The ground of the scooter is 1,256 mm and 145 mm respectively to make sure a good stability on the streets. One of the effective yet attractive bikes of Honda. It comes out with great features and specifications which makes it a number one choice. There are many reasons to go for it such as affordability, effectiveness, looks and much more. Honda Aviator 110 is powered by a 109cc, single-cylinder, 4-stroke, air-cooled OHC Dream Mileage engine with a maximum power of 8 bhp at 8000 rpm and a maximum torque of 8.74 nm at 5500 rpm, making it above average in terms of power for a scooter of this kind. It comes with V-matic transmission. With its powerful engine and lightweight body, the Aviator is capable of excellent acceleration, achieving 0 to 60kph in just 9.95 seconds, making it a bit speedier than the Honda Activa. Its maximum speed is roughly 85kph, a respectable achievement. The most important factor to opt this is that it’s a Honda product, hence no compromise is done with its features. The lightweight bike is there for customers who want an affordable product for themselves. Whether it is the Honda or not, you have to buy a two wheeler insurance if you owned a two-wheeler. It is mandatory by the Indian government. It will be illegal to drive on the road without a valid insurance. It will protect you and your bike from unwanted mishaps. Moreover, it will assist to deal with the third party liability in case of need. You should always go for a comprehensive product as it helps in getting great benefits.